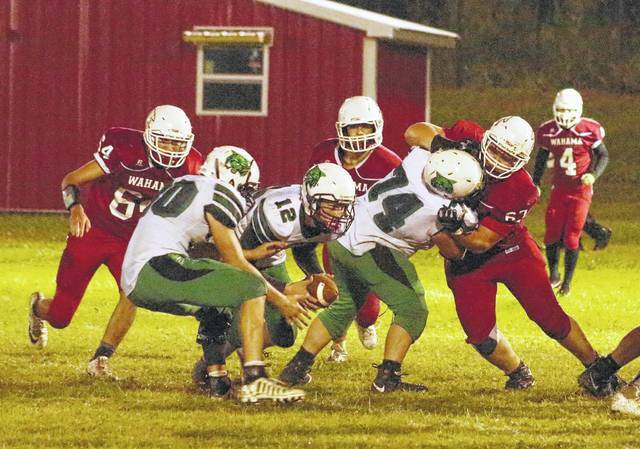 Last Week: Wahama lost to Waterford 27-0, in Mason; Southern defeated Frontier 41-0, in Racine. Last meeting between the teams: September 9, 2016. Southern won 46-8, in Mason. WHS offense last week: 76 rushing yards, 8 passing yards. SHS offense last week: 272 rushing yards, 15 passing yards. WHS offensive leaders last week: QB Bryton Grate 1-6-2, 8 yards; RB Christian Thomas 15 carries, 55 yards; WR Jacob Warth 1 reception, 8 yards. SHS offensive leaders last week: QB Logan Drummer 1-4-1, 15 yards; RB Dylan Smith 14 carries, 146 yards, 2TDs; WR Weston Thorla 1 reception, 15 yards. WHS defense last week: 140 rushing yards, 219 passing yards. SHS defense last week: 66 rushing yards, 4 passing yards. 1. Wahama’s last trip to Racine was on September 11 2015, when the Tornadoes claimed a 13-6 victory for their first win over WHS this century. 2. The Tornadoes have surpassed the 40-point barrier in both of their first two games. Last season, Southern scored over 40 five times, winning all five games by at least two scores. 3. Both teams were involved in a shut out last Friday, Southern on the winning end and Wahama on the losing side. The Tornadoes haven’t blanked two straight opponents since weeks seven and eight of the 2013 season. The White Falcons haven’t suffered back-to-back shut outs since prior to 1995. 4. The Tornadoes have gained 603 yards of total offense and crossed the goal line 12 times so far this fall. Of those totals, 588 yards and all 12 scores have come on running plays. 5. The White Falcons have gone with a balanced attack through two games, running for 193 yards and passing for 142 yards. Wahama has scored two touchdowns so far this year, one rushing and one passing. Last Week: Manchester lost to Miami Valley Christian Academy 45-0, in Cincinnati; Hannan lost to Green 12-0, in Franklin Furnace. Last meeting between the teams: October 5, 2012. Manchester won 36-28, in Manchester. Current head-to-head streak: Manchester has won 1 straight. MHS offense last week: 73 rushing yards. HHS offense last week: (-32) rushing yards, 109 passing yards. MHS offensive leaders last week: N/A. MHS defense last week: 397 rushing yards. HHS defense last week: (-4) rushing yards, 17 passing yards. 1. Hannan and Manchester played a two-game series in the 2011 and 2012 seasons, with both teams winning on their home field. The last time the Greyhounds visited Ashton was October 7, 2011, when the Wildcats claimed a 26-14 win. 2. Manchester was held scoreless in last week’s loss, but scored twice in Week 1. The Greyhounds’ first score of the year came on a 36-yard Shawn Gould run. Late in Manchester’s Week 1 game, Avery Reed returned a kickoff 98 yards for a touchdown. 3. Of the Wildcats’ 109 passing yards last week, 85 came on one play. Hannan recorded just three first downs in the game, allowing 12 in the process. Last week, Manchester lost the turnover battle by a 2-0 count, while Hannan tied Green with two turnovers apiece. 4. Hannan is still looking for its first points of 2017. Through two games, the Wildcats have allowed a total of eight touchdowns, four rushing, two passing, one fumble return and one interception return. 5. This is Hannan’s second home game of 2017. The Wildcats 2-3 at home last season, their best home mark since 1997, when they were 3-2 in Ashton. Last Week: Point Pleasant defeated James Monroe 20-14, in Lindside; Warren lost to Marietta 50-16, in Marietta. Last meeting between the teams: September 26, 2009. Warren won 35-13 in Vincent. Current head-to-head streak: Warren has won 1 straight. PPHS offense last week: 267 rushing yards, 69 passing yards. WHS offense last week: 158 rushing yards, 88 passing yards. PPHS offensive leaders last week: QB Cason Payne 8-17-0, 69 yards; RB Cason Payne 20 carries, 131 yards, 1TD; WR Josh Wamsley 5 receptions, 42 yards. WHS offensive leaders last week: QB Ronnie Hill 5-13-1, 88 yards; RB Tyler Schafer 11 carries, 85 yards; Evan Gandee 1 reception, 17 yards. PPHS defense last week: 107 rushing yards, 207 passing yards. WHS defense last week: 229 rushing yards, 103 passing yards. 1. Point Pleasant is headed to the Buckeye State for the first time since September 25, 2015. PPHS has won its last three games in Ohio and the Big Blacks have claimed eight straight games over OHSAA opponents. 2. Point Pleasant has had back-to-back games decided by less than one score. The Big Blacks hadn’t been involved in multiple one-possession games consecutively since 2012, when PPHS strung together a one-point win, a five-point win and a one-point loss. 3. The Big Blacks have won their last 21 regular season road games, with their last a regular season road game loss coming was October 5, 2012, at Oak Hill. 4. Warren and Point Pleasant played each other in eight consecutive seasons from 1996-to-2003, while PPHS was a member of the Southeastern Ohio Athletic League. In those games, the Big Blacks claimed a 5-3 record with a 213-to-156 scoring advantage. 5. Through two games, Point Pleasant is even with its opponents in first downs, with 36 apiece. The Big Blacks have scored eight touchdowns, five rushing and three passing. PPHS has scored two touchdowns each each of the four quarters. Wahama junior Jacob Fisher, left, and senior Christopher Hesson (67) apply pressure to Waterford quarterback Peyton Stephens (12) during the second half of a Week 2 footbal contest at Bachtel Stadium in Mason, W.Va.